1. To graft or insert. See also: graft, transplant, prosthesis. 2. A surgically inserted or imbedded graft or device; also, a zone of cells or tissue transferred from another site through a developmental error or neoplastic process. /im·plant/ (im-plant´) to insert or to graft (tissue, or inert or radioactive material) into intact tissues or a body cavity. /im·plant/ (im´plant) an object or material inserted or grafted into the body for prosthetic, therapeutic, diagnostic, or experimental purposes. cochlear implant a mechanical alternative to hearing for deaf persons, consisting of a microphone, signal processor, external transmitter, and implanted receiver. endosseous implant , endosteal implant a dental implant consisting of a blade, screw, pin, or vent, inserted into the jaw bone through the alveolar or basal bone, with a post protruding through the mucoperiosteum into the oral cavity to serve as an abutment for dentures or orthodontic appliances, or to serve in fracture fixation. penile implant see under prosthesis. subperiosteal implant a metal frame implanted under the periosteum and resting on the bone, with a post protruding into the oral cavity. transmandibular implant a dental implant for patients with severe mandibular alveolar atrophy; it is fixed to the symphyseal border and traverses the mandible to attach directly to a denture, bearing the denture directly. a. To insert or embed (an object or a device) surgically: implant a drug capsule; implant a pacemaker. b. To graft or insert (a tissue) within the body. Something implanted, especially a surgically implanted tissue or device: a dental implant; a subcutaneous implant. 1 (in radiotherapy) an encapsulated radioactive substance embedded in tissue for therapy. Seeds containing iodine-125 may be implanted permanently in prostate and chest tumors, and seeds of iridium-192 in ribbons or wire may be embedded temporarily in head and neck cancers. Sealed sources of cesium-137 or radium-226 may be implanted in the body cavity temporarily in the treatment of gynecological malignancies; strontium-90 in sealed sources may be embedded for a brief period (usually less than 2 minutes) in the treatment of eye tumors; needles containing radium-226 may be used as temporary interstitial implants. Patients with radioactive implants are isolated from other patients whenever possible. 2 (in surgery) material inserted or grafted into an organ or structure of the body. The implant may be of tissue, such as in a blood vessel graft, or of an artificial substance, such as in a hip prosthesis, a cardiac pacemaker, or a container of radioactive material. A pliable silicone shell filled with saline (formerly with silicone gel) and placed between the skin and pectoral muscle o cosmetically enhance the breasts. A titanium device—e.g., Brånemark system, Nobelpharma—which is surgically placed in the mandible or maxilla and allowed to “fuse” for 3 to 6 months to the bone (osseointegration), which serves as an anchor for attaching artificial teeth. Any device placed into a surgically or naturally formed cavity of the human body and intended to remain there for a period of 30 days or more. (1) A generic term for a secondary tumour nodule, often understood to mean a mass that is not contiguous with the primary neoplasm, which is most common on the free surface of the peritoneum. The term as used in surgical pathology is semantically problematic as it implies implantation of a primary lesion elsewhere in the peritoneal cavity, usually of the ovary, and ignores the possible origin of such implants from “renegade” embryonic rests in the peritoneal cavity and/or a multicentric origin of the lesions. (2) A cluster of epithelial cells in the peritoneal cavity in patients with epithelial ovarian neoplasms that are of either borderline (i.e., of uncertain malignant potential) or frankly malignant (e.g., serous, mucinous cystadenocarcinoma). A small amount of radioisotope sealed in a needle, seed, wire, or catheter, which is placed directly within or near a tumour to deliver brachytherapy. noun A device that is inserted to preserve or maintain a function (e.g., a hip or knee prosthesis), or to preserve, enhance or alter a contour (e.g., a breast or chin implant). verb To surgically place such a device in its appropriate site. A material that is not original to its location. See Baerveldt glaucoma implant, Bioimplant, Dental implant, Molteno implant, Penile implant, Silicone implant, Visual implant Audiology See Cochlear implant Breast surgery A silicone shell shaped in the form of a breast and filled with saline or silicone gel Dentistry A titanium device–eg, Brånemark system, Nobelpharma that is surgically placed in the mandible or maxilla, allowed to 'fuse' in 3 to 6 months to the bone–osseointegration, which serves as an anchor for attaching artificial teeth Oncology Tumor implant, see there Surgery noun A device that is inserted to preserve or maintain a function–eg, a hip or knee prosthesis, or to preserve, enhance or alter a contour–eg, a breast or chin implant verb To surgically place such a device in its appropriate site. See Breast implant, Permanent adjustable implant. 2. Material inserted or grafted into tissues. 3. dentistry a graft or insert set in or onto the alveolar recess prepared for its insertion. 4. orthopedics A metallic or plastic device employed in joint reconstruction. An implant to repair bone or to cover implanted objects such as artificial hips or tooth implants. Any substance, tissue, or object placed surgically in the brain. A surgically inserted object used to change the size and/or contour of the breast or chest wall, either using the patient's own tissue, e.g., a pedicle graft, or a prosthesis. An electrical device that receives sound and transmits the resulting signal to electrodes implanted in the cochlea. That signal stimulates the cochlea so that hearing-impaired persons can perceive sound. Cochlear implants increase the likelihood of meningitis. Patients with cochlear implants should be vaccinated against pneumococcus and Haemophilus influenzae type b (Hib). A dental prosthesis that is partially submerged and anchored within the bone. The blade form and the cylinder form are the two types of endosteal implants used. The cylinder form, which is most common, consists of a screw, a small titanium cylinder, and an abutment surgically inserted into the bone. 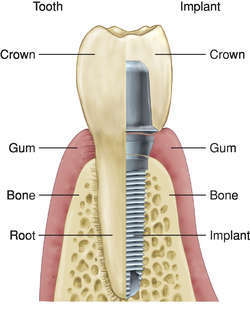 The blade form consists of one or more abutments. In both forms, the prosthetic device is placed on the abutment(s). An implant consisting of an applicator containing a radioactive source directly into a tumor to deliver a high radiation dose while sparing the surrounding tissues. 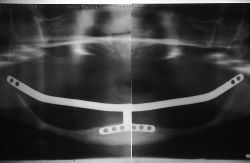 An implant consisting of an applicator containing a radioactive source directly into a hollow organ to deliver a high radiation dose to the organ while sparing the surrounding tissues. A prosthesis for edentulous patients who cannot wear dentures (e.g., because of mandibular atrophy). The implant consists of a metal framework that rests on the residual ridge beneath the periosteum but does not penetrate the mandible. A slowly dissolving polymer impregnated with chemotherapeutic drugs. It is placed into the tissue space from which a cancer has been removedto deliver a strong dose of chemotherapy to any residual cancer cells that escaped the resection. 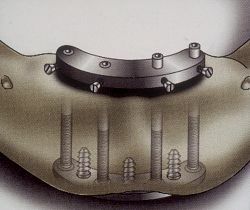 A fixture with one end implanted into the bone and the other end covered with a crown, often to serve as a stable abutment for a bridge or denture. 2. (īm'plant) A surgically inserted or imbedded graft or device; also, a zone of cells or tissue transferred from another site through a developmental error or neoplastic process. n a device, usually alloplastic, that is surgically inserted into or onto the oral tissue. To be used as a prosthodontic abutment, it should remain quiescent and purely secondary to local tissue physiology. n the portion of an implant that protrudes through the gingival tissues and is designed to support a prosthesis. n an implant with a narrow buccolingual wedge-shaped infrastructure that is designed to be placed deep into the bone. The outline of the implant appears similar to a nautical anchor, and there is a variety of sizes and shapes to satisfy many anatomic and prosthodontic needs. Endosteal anchor implants are cast of chromium-cobalt surgical alloy and annealed. n an implant placed in the anterior part of an edentulous mandible and designed to supply abutments in the two canine regions. n the major portion of the implant infrastructure. n a cast chrome-alloy glenoid fossa prosthesis available in right and left models. n an implant with a bladelike shape used when a patient's jawbone is considered too narrow to receive a screw or a cylinder endosseous implant. Because of its shape, this implant can be inserted directly into a narrow jaw. These implants must be anchored to another blade implant, root form implants, or natural teeth to assist in handling lateral forces. n an implant with a narrow (buccolingually) wedge-shaped infrastructure bearing openings or vents through which tissue grows to obtain retention. n an endosteal implant of a variety of designs constructed of silicate or porcelain. n that portion of an implant that connects the infrastructure with the abutment as it passes through the mucoperiosteum. n a narrow-diameter screw implant designed for thin ridges. n an implant used for an entire edentulous jaw. n a blade type of implant designed to be inserted into a completely edentulous ridge as a single appliance bearing multiple abutments. n the abutment part of an anchor implant. n a prosthesis (denture) that is secured to the implants via the abutments or a connector bar. n an implant with a threaded or nonthreaded pin that fits into a root canal and extends beyond the dental apex into the adjacent bone, thereby lengthening the clinical root. n an implant that is placed into the alveolar and/or basal bone and that protrudes through the mucoperiosteum. n a custom-designed implant constructed for a specific operative site. n the screws, 5 to 7 mm long, that are made of the same surgical alloy as the implant and are used to affix the implant to the underlying bone. n the end portions of the arms that rise to the most superficial portion within the bone. n a prefabricated mandibular full-arch implant consisting of two posterior ramus implants: an anterior (symphyseal) endosteal component and a conjunction bar. n a two-piece end-osteal implant consisting of a helical steel spring that is inserted into bone as a female and a male that may be placed postoperatively and serves as the abutment. 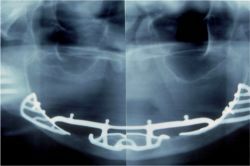 n the part of an implant that is designed to give it retention. n an artificial appliance made to conform to the shape of a bone and placed beneath the outer, or fibrous, layer of the periosteum. n a hollow device available in full, half, and shallow depths into which needle implants fit. The mandrel, in turn, is used in the contraangle to drive the needle implant into place. n an intermediate superstructure. A series of splinted copings, each of which fits over an implant abutment or natural tooth and over which fits the completed prosthodontic appliance. n (pin endosteal) a smooth, thin shaft (self-perforating) that serves as an implant usually in conjunction with two others, the three being placed in bone in tripodal conformity. nonsubmergible implant or a single-stage implant. n an acrylic resin implant, shaped like the tooth recently extracted, that is placed into the tooth's alveolus. n an apparatus such as an artificial limb or a crown, bridge, or denture that is affixed to an implant in order to compensate for a missing body part (teeth). n an endosseous implant placed posterior to the maxillary first molar up into the pterygoid plate. n a blade type of implant designed for the anterior part of the ramus. See also implant, endosteal, blade. n a full-arch endosseous implant set into both rami and the symphyseal area of the mandible with a horizontal connecting bar that sits along the gingival tissues, thus forming a design similar to a monorail with a tripodial effect. n a cylindrical mechanism used to affix dental structures to the bone located under the soft tissue. These implants are classified under two forms: a threaded screw-type implant, and a smooth press fitted implant. n a bayonet-shaped device designed to assist in seating an anchor implant by straddling its arms over a specially designed seating notch. n a bayonet-shaped, double-ended device designed to assist in seating an anchor implant by cupping its crown or abutment. n a device designed to be placed on a portion of an implant so that malleting on it will seat the implant into the bone. It usually has an angled or bayoneted shaft to enable it to protrude from the oral cavity in a more-or-less vertical direction. n the cervix of an anchor implant. n the unbroken surface of the wedge-shaped infrastructure that is widest and most superficial. This part is tapped during the seating of the implant. n an implant designed to replace a single missing tooth; usually unsupported by adjacent natural teeth. 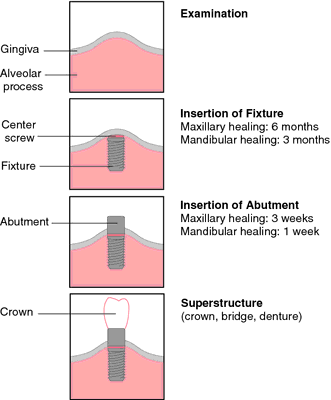 n a screw type of implant, either hollow or solid, usually consisting of abutment, cervix, and infrastructure. mandibular staple implant and transmandibular implant. n an implant, usually endosteal, that is available in manufactured form in uniform sizes and shapes. n a thin, striplike component of an infrastructure. n an appliance consisting of an open-mesh frame designed to fit over the surface of the bone beneath the periosteum. n a completed prosthesis that is supported entirely or in part by an implant. It may be a removable or fixed prosthesis but may be a single crown or a complete arch splint. n an endosseous implant with threads resembling a screw; also known as a screw-type implant. transosseous implant. See also staple implant. n an implant, either end-osteal or subperiosteal, having its infrastructure and abutment in separate parts. Generally, the abutment, which is threaded, is screwed to the infrastructure some weeks after its incision, so that healing has taken place. n an endosseous implant placed in the bone, with the soft tissue over the implant being sutured closed in a stage-one surgery to allow osseointegration of the implant. A second surgery is performed later in which the soft tissue over the submerged implant is removed in order to thread an abutment into the implant so that a prosthesis can be attached; also known as a submergible implant. n a long, screw-shaped endosseous implant placed in the area of the former first maxillary molar up into the zygomatic bone following an intrasinusal trajectory and used as an alternative to bone augmentation of a severely atrophic maxilla. 1. to insert or to graft (tissue or radioactive material) into intact tissues or a body cavity. 2. any material inserted or grafted into the body, e.g. carbon fiber, metal or plastic prostheses, hormone, electronic signal, growth promoter. foreign materials placed in the body tissues for purposes of assisting in some function, either temporarily or permanently. May be made of soft tissues, synthetics, metals, or ceramics that are relatively inert and compatible with body tissues.